Weddings… especially Indian weddings are famous for their glitz and gleam. When the whole spotlight is on the bride in all ceremonies and rituals…. The groom is somewhat left behind. Sometimes his attire is bought in a hurry and given less importance. The men’s attire should match up with the bride and both should look equally good. Choosing the outfit for your big day is a big task and when it is for once in a lifetime, it must be special. MY GRAND WEDDING has come up with a variety of options to stop the groom stumbling over the decision of outfit…. Though there are less choices for a man and most men are confused, there are still some options for an Indian groom…. 	Two-piece suit: - Comes with slim fit designs to give you style as well as comfort. 	Three-piece suit: - Classic suit which comes with variations in colour, fabrics. 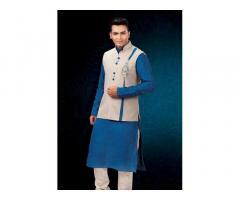 	Sherwani: - The most traditional outfit worn across the country with elegant designs and gorgeous colours. 	Dhoti: - Oldest outfit, fashionable twist and common among south Indians and Bengalis. 	Tuxedo: - Outfit for extremely formal weddings which comes with a bow tie. Accessories: - Wedding outfit without accessories is like incomplete. 	Tie: - Make your look complete by wearing a necktie and flaunt your look on your special day. 	Boutonniere/ pocket squares: - Fancy your look by wearing a boutonniere or pocket square on the left lapel. 	Cufflinks: - Made of various metals like glass, leather, stones worn to secure cuffs of dress shirts. 	Shoes: - Choose the colour of your shoes wisely according to your suit colour. 	Turban: - Usually worn with sherwanis, it gives a regal look on the groom. Shop your outfit this time in Chennai who provides sophisticated and fancy groom wear with a range of choices in styles and cuts. Chennai groom wear vendors are client-centric and know very well about their work. 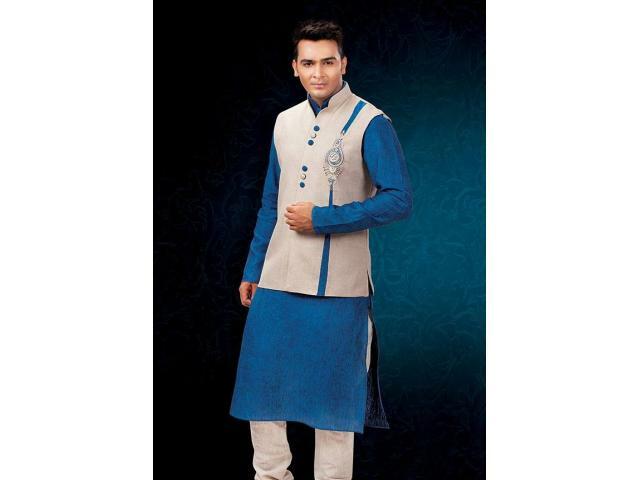 Ranging from customized suits, tuxes to various sherwanis, Nehru jackets, Bandhgala, waistcoats, Kurta pyjama sets they have a wide range of collection. Known as the city of Nizam, everything in Hyderabad has a regal flair. Check out the elegant traditional designs and prestigious formals. They reflect current trend modern styles from the best brands. With trendy sherwanis to tailored suits, Bengaluru groom wear vendors have all types of outfit which comes with comfort, style and proper fitting. With some exquisite collection of ethnic wear like nawabi sherwanis, bandis to modern western designs of Tuxedos, Italian tusks, Mumbai groom wear vendors are rocking the market. Visit the stores listed for an awesome outfit. Weddings are definitely not about the bride only. With upcoming styles and gorgeous outfits, Indian men have started to share the spotlight equally. So, men…. choose your outfit, put endless trials and be the fashion king. FEEL GOOD.